The Composition Mastery Workshop on DVD is similar to attending my 2 days Composition Mastery Seminar except that you don't need to travel and you can study the materials anywhere, as many times as you want. 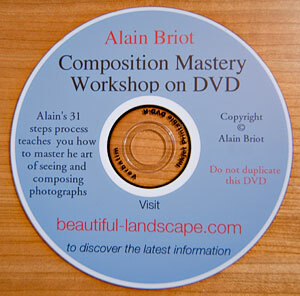 The Composition Mastery Workshop on DVD took me over one year to research and nearly 6 months to produce. In fact, the knowledge featured on this DVD tutorial goes much further back than a year. It features everything that I learned about composition since I started studying art and photography in the late 70's, early 80s at the Academie des Beaux Arts in Paris. The Composition Mastery Workshop on DVD is my most ambitious tutorial project to date. I am very pleased that it is now complete as I felt at times that I would never get it finished. What happened is I kept finding more material to add, and I kept having new ideas for things to include. As it stands it has to be the most complete tutorial for photographic composition that I know of, and I have researched the subject in depth. The Composition Mastery Workshop on DVD took over one year to research and complete. This very unique tutorial is based on the concept that composition encompasses much more than the rules of composition (the traditional rules that we have all been taught such as the rule of thirds, the golden rule, leading lines and so on). Instead of being just about these rules (that many photographers find limiting and restrictive), I believe that composition is about everything that has an effect on the visual contents of a photograph. This means that, in this tutorial, I look at how light, color, contrast, black and white, personal style, inspiration, cropping, framing, image borders, edges, vision, your audience, the location, your knowledge of astronomical events (sun and moon movement and location in the sky at a given time of day and year), stitching, lenses, exposure, print reviews, and much more. I also provide you with a checklist for print reviews in which I offer cures for what I call the most common "print maladies." I also look at what is a fine print and at the qualities that a print has to have to be considered world-class. My goal is to help you not only learn what a well-composed fine art print is, but also help you refine the quality of your prints and of your compositions. I have completed the first 5 of the 32 steps in the Composition Mastery Workshop on DVD and I am extremely pleased and impressed with the material. Having purchased and looked through hundreds of books, and after taking a few online courses I can say with certainty that I have not found this information anywhere else,especially in this detail. This workshop on DVD is everything I had hoped for, and I've barely scratched the surface. I particularly like the multi media approach that covers the same material in written form as well as audio andvisual. The three approaches together insure retention of the material. Thank you for producing such a high quality product! I will update you in afew weeks as I delve deeper. F - 12 Photoshop Layered Composition Master Files used to demonstrate specific steps on the DVD and allow you to practice these steps on your own images. A 8x10 mat size Fine Art Companion Print of one of the images I discuss in the DVD: Luminous Canyon. This photograph is printed to my exacting standards using the exact same optimization steps, printer, software and paper that I use for all my fine art prints. You also receive the Master file for this Companion Print. This companion print allows you to compare the print to the Master file, compare my prints to yours and evaluate your work and your system precisely. The value of this Master companion print with the master file is $150. It is not sold separately. 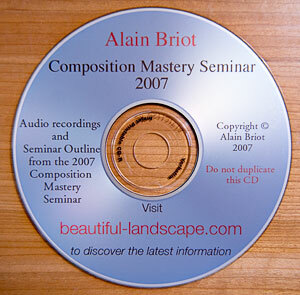 A 9 hours audio recording of the 2009 Composition Mastery Seminar on a separate CD. This recording features each session of the 2009 Seminar, for a total of 9 hours of live audio recordings. It is the closest thing to actually attending the Seminar without being physically there .The Composition Mastery Seminar Audio CD alone is worth the price of this entire package. This Audio CD is not sold separately. A set of 8 composition viewfinders. These viewfinders are provided in the following formats: 4x5, 35mm, 6x17, 6x12, 6x9, 6x4.5 and 6x6 (square). These viewfinders are portable and designed to be used in the field or in the studio. I explain how to use these viewfinders on the DVD in great detail in my tutorials. Updates to the 29 steps and 200 sub-steps will be provided to you in the updates area. These updates are posted to a private area of my website. As a DVD owner you will receive the link to the updates page when you place your order. Updates are posted when new composition tools become available, when I change my approach to composition, or when I write new essays on composition. New image commentary movies will also be posted regularly to the updates page. Image commentary movies are tutorial movies in which I describe in-depth how I composed a specific image, which choices I made in regards to composition, which rules I followed, or broke. I also talk about why I decided to optimize the image a certain way, why I selected a certain light quality, certain colors, contrast level, brightness, or made the image black and white instead of color, and so on. I also talk about why certain compositions do not work because seeing what did not work is often just as instructive as learning what did work. I provide 8 commentary movies on the DVD, and more will be provided in the Updates area. These updates consist of tutorial movies, audio recordings and PDF files demonstrating how I use these latest versions, what are their advantages, how it fits in my workflow, and so on. The Composition Mastery Workshop on DVD teaches you the exact 29 steps and over 200 sub-steps that I follow to compose my fine art photographs, starting with an idea, an inspiration, and going all the way to a image whose composition has been optimized so that it conveys a specific message, or concept, with my audience in the most effective manner possible. The DVD covers everything that I do after the original photograph is taken. It starts with a description of my approach to composition, which is (in a nutshell) that composition is much more than the traditional rules of composition) then continues with a study of color, black and white, light, borders, framing and many more areas which all have a profound impact on photographic composition. I call this process Alain's 29 steps process because it consists of a total of 29 very careful chosen main steps. Each of these main steps is divided into sub-steps, each of the 29 steps having from 5 to 15 or more sub steps. The total number of steps and substeps is about 200. You can study each of the steps and sub-steps in chronological order, or you can study then in the order that you like best. Because composition focuses essentially on the artistic apect of photography, the order in which these steps are completed can be adjusted to fit your personal taste and approach. The steps outlined on the Composition Mastery DVD are taught in my Composition Mastery Seminar. However, the seminar lasts two days and I teach for about 16 hours (8 hours each day). The DVD on the other hand features nearly 40hrs of presentations, much more than I can teach during the seminar (the seminar would have to be 4 or 5 days long to feature everything that is on the Composition Mastery DVD). Furthermore, the Composition Mastery DVD is something you can watch, listen and study over and over again, without the need to take any notes because the quicksteps are a summary of the main points I make in each of the 29 steps of the DVD. The seminar on the the other hand requires you take notes and be physically present. 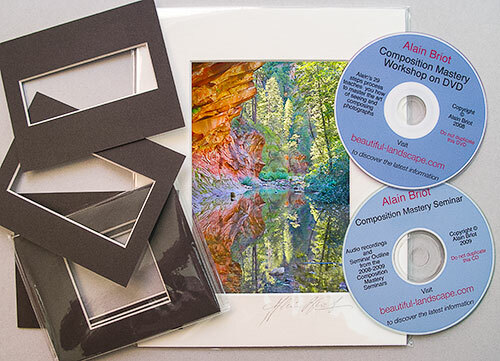 The Composition Mastery Workshop on DVD is my third DVD tutorial designed to replace attending a workshop (the two other are the Printing Mastery and composition Mastery Workshops on DVD). This is why “Workshop” is part of the DVD title. To achieve this goal all the materials that are taught during the Composition Mastery Seminar are included on the DVD. Furthermore, the DVD is organized along the same outline as the seminar, and features tutorial movies or audio recording or PDF presentations that duplicate the presentations I give during the seminar. You also receive a recording of the 2009 composition Mastery Seminar that features all the sessions taught during the Seminar. My goal is to provide an amount of Video, Audio and PDF tutorials equivalent to the presentation time offered during the Composition Mastery Seminar. In effect, as I mentioned above, I greatly exceeded this goal and the Composition Mastery Workshop on DVD features nearly 3 times the amount of information featured during the Seminar. B - You can watch each presentation over and over again instead of just once. C - You can carry the DVD with you on your laptop then study and practice each step wherever you want. D - You can listen to the audio files on your mp3 player, your iPod, in your car, or any place you like. E - You do not need to take notes. Quickstep files with step by step instructions of each procedure are provided on the DVD. You can even print these Quickstep files for reference. These Quickstep files are available exclusively on this DVD. ----- A detailed list of all the software, hardware and other tools that Alain uses to help him research and compose his photographs. This represents a huge amount of research that you will not need to do on your own. ----- MP3 Files of each audio presentation - listen to them in your car, on your ipod, anywhere. G- As a Composition Mastery DVD owner you receive unlimited access to the DVD Updates area . The updates area is accessible any time you like. You can download the updates any time you want. The link to the updates area is emailed to you when you place your order. 1 - The Composition Mastery Workshop on DVD with 40 hours of tutorials, over 200 PDFs, quicksteps, essays, Master files and more. 2 - The complete recording of the 2009 Composition Mastery Seminar. This recording is not available separately. If it was it would sell for $600. 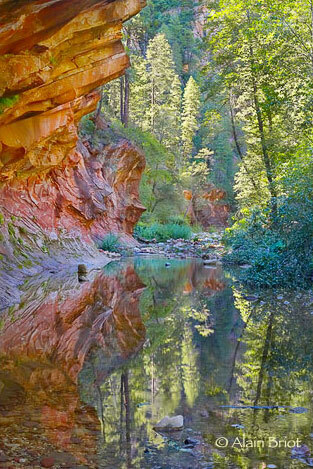 3 - The Luminous Canyon fine art print as an example of composition, print quality, matting, mounting and presentation for a fine art print, a $150 retail value (this print is not available separately and is therefore a collector's item). 4 - Access to the DVD Updates area at no extra cost. The updates area is accessible any time you like. You can download the updates any time you want. The link to the updates area is emailed to you when you place your order. 5 - The opportunity to ask questions regarding composition and to have your answers posted to the DVD updates area. 6- A $100 off coupon towards registration in any of the workshops taught by Natalie and I. The coupon carries no expiration date. 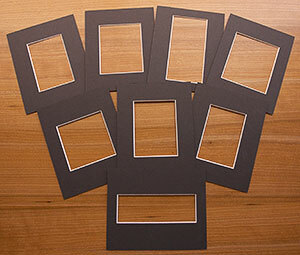 7 - A set of 8 viewfinders in the most common film and digital camera formats.